Through an odd circumstance of timing, this review follows on the heels of another book recounting a year in the life of a golf writer. Unlike James Dodson’s midlife ramble in The Dewsweepers, however, Darren Kilfara’s memoir is of the coming-of-age variety. Kilfara was a student at Harvard and member of its Division I NCAA golf team, and an apparent master of working the angles. For example, during an internship with Golf Digest he frequently took advantage of the magazine’s arrangement with nearby Yale University to play the school’s storied golf course. He also figured out how to use Harvard’s academic year abroad program for the sake of golf. Kilfara convinced the school’s History Department chairman to approve his departure for a pair of semesters at St. Andrews University. Golf Digest also chipped in with an assignment or two to help offset the additional cost. 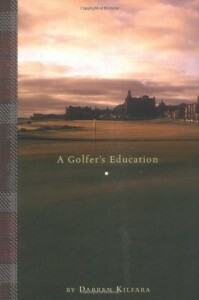 The deal required Kilfara to research and write not only about St. Andrews, but also several of the less well-known courses dotting the Scottish landscape. In other words, despite his apparent youth and inexperience Kilfara cleverly devised the perfect golfer’s education. Of course, he learned about much more than golf, and like any young man, he needed the additional course work. I give him credit for his honesty in this respect. He discusses the familial reasons for his aversion to alcohol, his occasional flaring temper, and his rueful recognition that he’s too focused on scoring. In addition, the charming saga of his fitful romance with the first Scottish girl he meets displays his occasional bouts of immaturity without pity. Kilfara also gives the impression that he was a fairly indifferent scholar while at Harvard, and carried that attitude with him overseas to the storied university town. That changes, as Kilfara explains the differing approach to college education in Scotland, which demands a more mature approach from its students along with a lighter course load. This is not to say that Kilfara led a monastic existence. He sketches a view of university life at St. Andrews that will bring back some fond memories for those who understood that not everything worth learning at college was to be found at the library. Late night pointless sporting events also have their place, and Kilfara’s recounting of refereeing one such tradition is particularly funny. He also writes one of the better arguments of the pleasures of playing golf in solitude. For many golfers this is not an option, due to the crowded conditions of most public courses. One of the benefits of the travelogue sequences Kilfara sprinkled throughout his narrative is that many of the Scottish courses he described welcome golfers who would rather play alone. Kilfara also gives the novice bettor a useful primer on the many ways British bookies can separate a fool from his money. Widespread legalized gambling is possibly among the more overlooked differences between Great Britain and the U.S., and Kilfara’s misadventures in trying to score a big hit on a European Tour event were illuminating. He also presents a wry commentary on the Scottish attitude toward soccer and golf. As befits a perceptive writer living in a small town for nearly a year, Kilfara gives a full portrayal of the town of St. Andrews, beyond the famous golf courses, medieval ruins, and its other tourist-oriented parts. He shows that St. Andrews is not immune from several of the recurring problems of other nearby towns with a few deft examples. I consider this portion of his memoir one of the signs of his growing maturity, especially compared to the first few weeks of his arrival. The title of this book is only a little misleading. 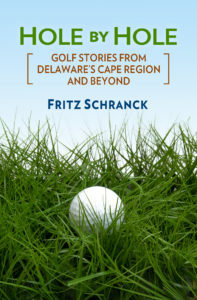 A golfer does receive an education that is retold nicely in this little memoir. Any assumption that the education was limited to golf, however, would be false.